Click here for information on our Dalton, GA location! Epic Enterprises is a manufacturer of replacement parts for Volkmann & Verdol / ICBT cablers & 2X1 twisting machines; Superba and Suessen carpet yarn heatsetting machines, and Belmont winders. Epic manufactures Epi-Mark™ yarn and fabric markers. Epic reconditions lubricated spinning and twisting rings and also sells new and reconditioned lubricated ring assemblies. Epic has developed a dependable, superior rebuild service for pot bearing housings and spindles; repairs for pots; and many other repairable items for Volkmann, Verdol and ICBT machinery. Epic is proud of our continually expanding global presence! We currently service more than 77 countries through an established network of qualified agents and dedicated distributors around the world. Our close-knit association of agents and distributors take pride in providing top-notch service that has continued to support and grow our relationships with many satisfied customers around the world. Every day our website is busy with new viewers who can submit questions and inquiries via our online contact form. Whether you are in Africa, Asia, Australia, Europe, or South America, Epic has the capability to meet your replacement parts needs. If you are visiting our website for the first time, please be sure to check out our agent listing to find an agent to service your needs! NEW: Click on the 'EPIC Online Catalog' button to visit our new interactive catalog and submit your quote requests with ease! 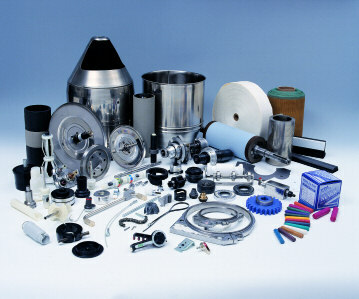 Epic products are intended as replacements for worn or damaged parts in OEM products. OEM Part numbers in (parenthesis) indicate either 1) improved design 2) the part serves the same function as the OEM part, but may differ from the OEM design, or 3) it is a component of an assembly where no OEM reference number is available, or 4) it is a repair service for the referenced part. Volkmann is a trademark of Saurer AG. Verdol/ICBT is a trademark of Reyes Group. Superba is a trademark of Superba SAS. Suessen is a trademark of Spindelfabrik Suessen, Schurr, Stahlecker & Grill GmbH. Belmont is a trademark of Belmont Textile Machinery. Murata is a trademark of Murata Machinery, Ltd. YiChang is a trademark of Jingwei Textile Machinery Co., Ltd. Epic is not affiliated with these companies. Parts with EE designations are manufactured by Epic and are not authorized by the original equipment manufacturers.